If you enjoy cuisine and customer service, you might be interested in a career as a personal chef. Personal chefs work in their clients’ homes and tailor what they cook to specific requests. Unlike restaurant chefs, personal chefs meet with their clients long before cooking a meal, in order to go over menu details. “A personal chef’s goal is to make every meal the very best meal you’ve ever tasted,” says personal chef Terry Henderson. Henderson says that a personal chef will probably cook for several families or individuals to maintain full-time work. So how do you get started? “Get out into the community, talk about what you do, volunteer at schools and community functions, talk to schools and mothers’ groups,” he suggests. Training can help, too. “We suggest that our members have some training,” says Henderson. Professional associations offer courses and self-employment packages. Culinary training can be found at many post-secondary institutions. Personal chefs may also be self-taught. “You need to have solid cooking skills,” says Gord Johnson. He is the director of program development for the American Personal Chef Association. Johnson says cooking courses are a must if you don’t already have skills as a chef. Johnson also says that specific training for personal chefs is a good idea because it can help you avoid making mistakes or wasting time. Johnson says younger people may want to develop life experiences before becoming a personal chef. While what you know about cooking is important, personality is a factor too. Personal chefs must relate well to clients, but they also need to be assertive enough to advertise and promote their services. Wendy Perry is a personal chef and co-founder of the Personal Chefs Network Inc. She says that an outgoing nature can help a personal chef get started. Perry says that some personal chefs are able to work full time right away; others may take a few months to build up steady clients. There were 4,900 people employed as private household chefs, according to the Occupational Employment Statistics (OES). Their median annual earnings was $22,870 in 2006. 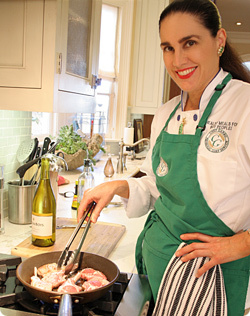 Mia Andrews is president of a personal chef association. Andrews says that time pressures and a new understanding of the importance of diet prompt people to hire personal chefs. People know they need to eat healthier, but the window of time for nutritious family meals is still small in many households. “Personal chefs enter the picture by being an answer to both the time stress and the need for healthy eating,” says Andrews. According to Andrews, a personal chef can expect to earn about $200 per working day, but the wage can be higher. And most personal chefs are in business because they love what they do and enjoy working with families. “I personally love the feeling of starting a cook day knowing that I’m about to do what I love for the next six hours. When I get clients hugging me or phoning me telling me how much they enjoyed their meals, it means a lot,” says Andrews. As families find their time together shrinking, the call for personal chefs will keep growing. My sister is currently doing culinary arts and will graduate as a chef next year. Although it is stated that personal chefs are not recommended for those who are straight out of school, I know that this is what my sister would ultimately like to do after maybe five or six years in the industry. I will make sure she reads this. Thanks! There are a lot of people who are changing careers because of stresses at work, and for somebody who loves food and cooking, this might just be a lucrative career. Back in 2006, the average annual income for a personal chef was $42,000, and it is projected to grow in the next 10 years. To become a personal chef, you really need to plan well – always consider food costs, the time involved, equipment and licensing needed. It’s great if you’re eyeing an affluent community to offer your services to, and I guess the elderly would have more use for a personal chef, with all their dietary specifications.